If you are looking for an opportunity to enforce the use of account codes; or if you are needing to charge back the cost of calls to a specific department; or if you are looking for extra security then, 3CX Enhanced Billing Codes is the answer! 1.1. Why 3CX Enhanced Billing Codes? 3CX allows you to optionally assign an account code when you place a call, but there is no verification that the account number exists or was typed correctly. If you forget to enter the account code before the call is placed, there is no way to assign an account to the call. 1.2. What are its features? When making external calls, staff must enter a customer/ account billing code to initiate the call, making it impossible to lose the call billing information. All external calls are associated with a billing code. Upon completing a call, the information is be logged in a database for reporting. To initiate an outbound call, you call extension 8 (for prompted guidance) or 9 for the streamlined process. When using the prompted extension, 3CX will ask for your account code and the number to dial. Dialing extension 9, you hear a beep letting you know the system is ready, then you type your account code followed by the desired phone number, and 3CX will initiate the call for you. Whether you use the prompted or streamlined version, the process is simple. Whether you are an attorney, consultant, or simply want to track the cost of calls by department, 3CX Enhanced Billing Codes enables you to keep track of outbound calls. You can even pre-assign a cost for each outbound call by country, area code, or even down to specific phone numbers. Reports will automatically calculate the duration and costs of calls greatly simplifying the invoicing/chargeback process. Account Codes can also define restrictions on the types of calls permitted. For example, one account code could be used for a lobby phone to only permit calls to specific extensions. Another account code may restrict international calls to specific countries or specific phone numbers within that country. Account code restrictions will block calls if the phone number dialed is less than the minimum or more than the maximum number of permitted digits, or block calls starting with digits that match a list of specified prefixes (separated by a comma). A list of prefixes could include something like 801,004,920988. 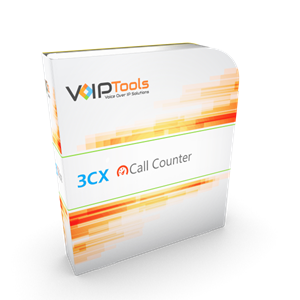 With 3CX Enhanced Billing Codes you now have greater visibility into the source of your telecom costs. Your outbound calls are logged automatically; enabling you to run enhanced billing code reports by account code, department, extension, date range and more. Knowing the source of telecom costs makes it possible to easily manage your costs. 3CX Enhanced Billing Codes provides greater security. While 3CX can help restrict international calls by extension, if someone (cleaning crew for example) can gain access to the phone (extension) they can make unauthorized calls. With 3CX Enhanced Billing Codes you add an additional layer of security by also requiring an account code. Now security restrictions are not limited to extensions only. Your outbound calls will be logged automatically, enabling you to run enhanced billing code reports by account code, department, extension, date range and more. Knowing the source of telecom costs will make it possible for you to easily manage your costs. • Microsoft SQL Server 2008 or above (including the free Express). SQL Authentication is recommended. 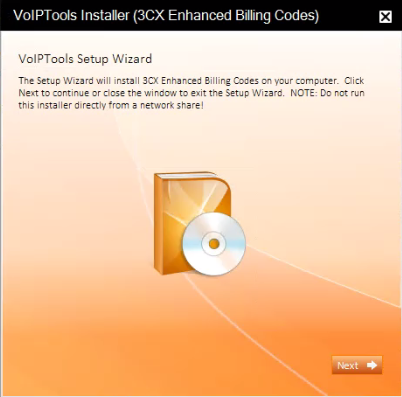 You can order 3CX Enhanced Billing Codes on-line at http://www.voiptools.com. Your order confirmation email will include your license key and a link to download the software. You must register your license key to activate 3CX Enhanced Billing Codes. Your license key is included in your order confirmation email, and can also be found in your order history on our website. When downloading your software, your browser may strip the .zip extension from the file name. If needed, simply edit the file name to add the extension .zip. 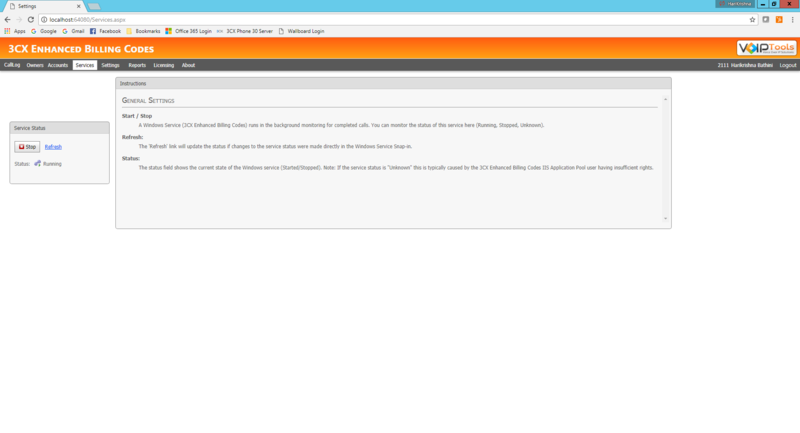 installed directly on the 3CX server. 2. 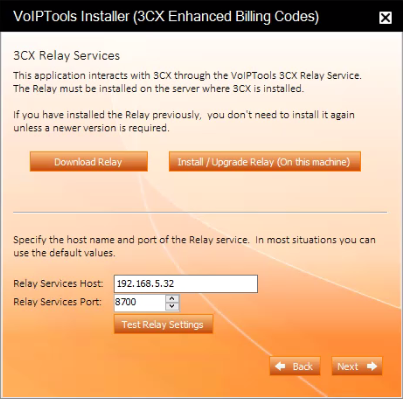 If you are installing 3CX Enhanced Billing Codes directly on the 3CX server, you can install the Relay simply by clicking the Install/ Upgrade Relay button and following the Relay install instructions. 1. In the Relay Services Host field, enter “localhost” if installing 3CX Enhanced Billing Codes on the 3CX server. If 3CX resides on a different server, enter the IP address or FQDN of the 3CX server. The default port number is 8700. You will need to open this port on your Windows firewall, or your edge firewall if 3CX is running on a remote server. 3. Click Test Relay Settings to confirm 3CX Enhanced Billing Codes can communicate with the Relay services running on the 3CX server. 4. If 3CX Enhanced Billing Codes is able to successfully communicate with the Relay service running on the 3CX server, a Success message box will display. Click OK. 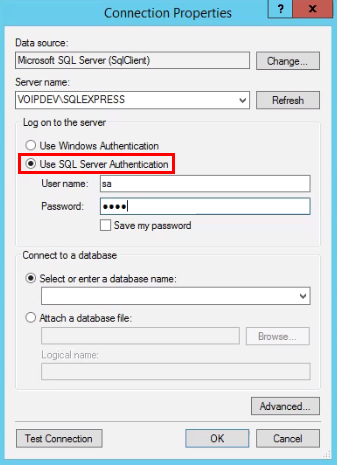 If you want to use ‘SQL Authentication’, then install SQL Server in ‘Mixed’ mode (recommended). 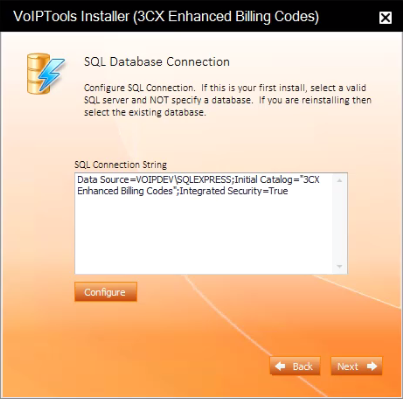 The first time you install 3CX Enhanced Billing Codes, DO NOT enter a database name. 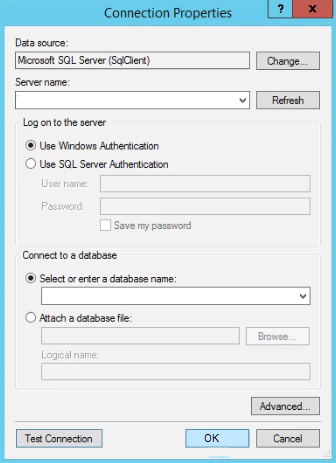 Choose Select or enter a database name and leave the database name blank. 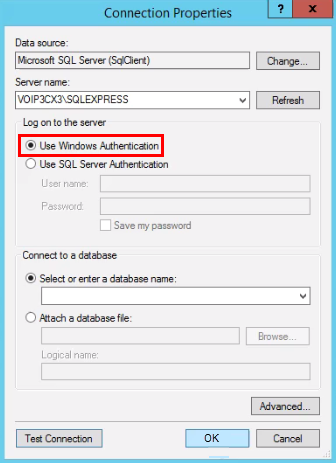 The installer will create the SQL database automatically and apply the necessary permissions. If upgrading 3CX Enhanced Billing Codes from a previous version, select the existing database from the list. 7. 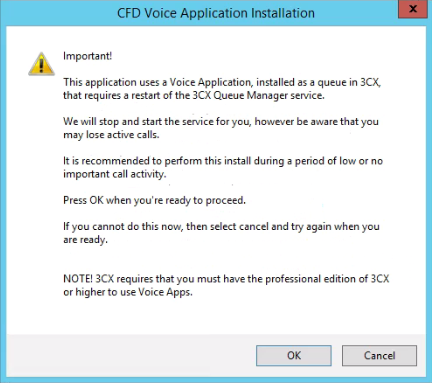 An alert message appears that suggests you to perform the installation only when you don’t have any active calls running. a. Click OK if you don’t have any active calls running to continue the installation. If there are any active calls running, and if you click OK, you may lose the calls. 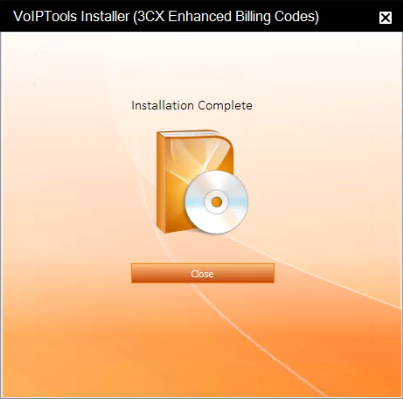 VoIPTools recommends you perform this install during a period of low or no important call activity. b. Click Cancel if you want to cancel the installation process and retry when you don’t have any active calls running. 3CX requires the Professional edition of 3CX or higher to use Voice Apps. To access the ‘3CX Enhanced Billing codes’ web portal, click the Web Portal desktop icon that was created during the installation process (3CX Enhanced Billing Codes web). 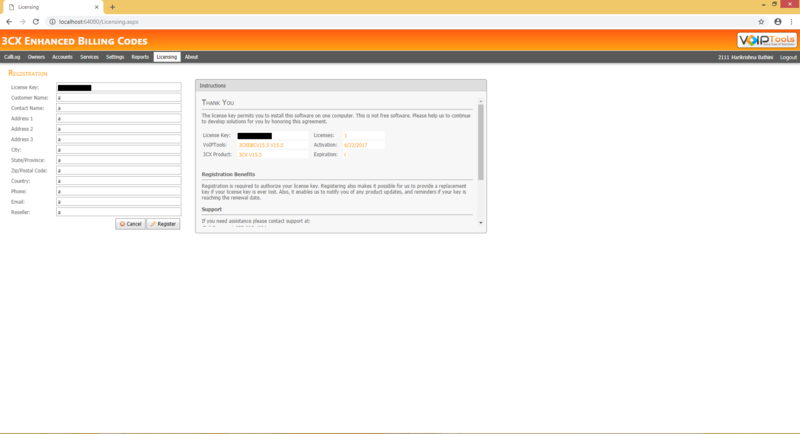 Based on your privileges, you can login either as an Administrator or as an Agent. 1. In the Licensing tab, enter your registration information in all the fields (Note the red dot denotes a required field). The Call Log screen enables you to view the timing, collection and evaluation of data for all the telephone calls. 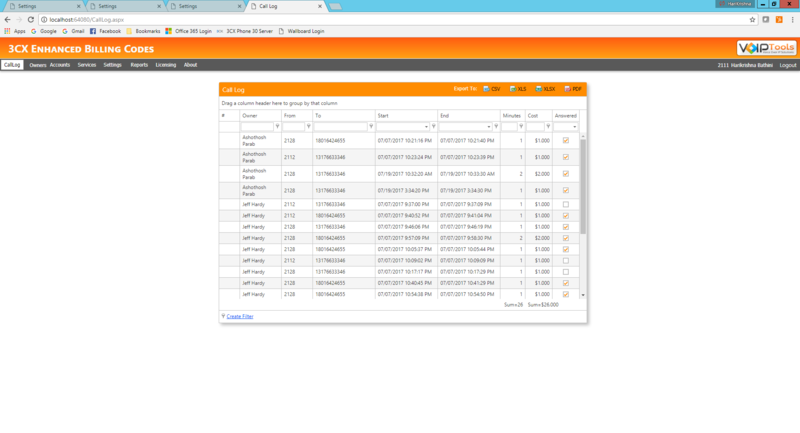 You can also export the call log report to various formats like .csv, .xlsx and pdf. The filter enables you to restrict the data displayed/ exported based on the criteria you enter. The information displayed is read only. The extension number that initiated the call. The start time when the call was initiated. The end time when the call was terminated. The duration of the call (in minutes). The cost of the call based on the price in 3CX. The checkbox will be checked if the call was answered or unchecked if the call was not answered. 1. In the Call Log tab, on the filter row, enter the selection criteria to restrict the call data for the report or data to export. 2. On the Call Log header, beside Export To, click the appropriate export button to export the logs in your desired format. The Owners screen enables you to manage Owners, including assigning emails for automated reports and activate or inactivate an owner. Once an owner is successfully created and activated, the Owner displays in the Owner drop down list of the Accounts screen. Account code reports will be grouped based on the Owner assigned to the account. 1. In the Owners tab and in the column header of the first column, click Add button. 2. In the Owner Name field, add the owner name. 3. In the Email Address field, enter valid email address for the owner. You can enter multiple addresses separated by a comma. 4. In the Active checkbox, check the check box if the owner should be active or uncheck if the owner should be inactive. 5. Click to save the owner. 1. In the Owners tab, select the record of the owner that you want to edit. 2. Select the field that you want to edit and make necessary changes. 3. Click to save the update for the owner. 1. In the Owners tab, select the record of the owner that you want to delete. 2. Click Delete button beside the record that you want to delete. 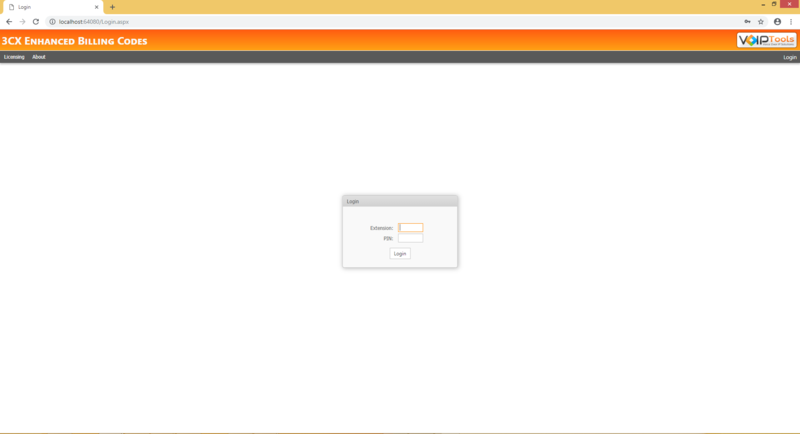 The Accounts screen enables you to create an account code. From here, you can define restrictions on the types of calls permitted. These restrictions will block calls if the phone number dialed is less than the minimum or more than the maximum number of permitted digits, or block calls starting with digits that match a list of specified prefixes (separated by a comma). The editor enables you to select a fixed length for your Account Code. If the code length is selected as ‘0’ then, the Account Code length value will not have any restrictions. This column displays ‘Account Codes’, which are used for (billing) tracking purposes. With these codes, you can control cost allocation and out-going call restriction. Brief description about the account. The name of the ‘Account’ owner. Check this check box if you want to apply the restrictions defined for the Account Code. The first number of dialed digit(s). Here, you can enter multiple prefix codes separated by commas (,) (for example: 801, 004, 920988). If the ‘Restrict’ checkbox is checked, then the prefix restrictions will be applied to all the calls using this account code. Check the check box if you want to activate the account. If an account code is no longer used, uncheck the checkbox. •	In the Accounts screen, from the Fixed Length Account Codes field, enter the fixed length of all account codes. •	Beside the Fixed Length Account Codes field, click Save. •	A warning message may appear if existing account codes do not match the specified fixed length. Click OK.
•	On the Accounts screen, in the Fixed Length Account Codes field, enter the value of ‘0’. •	Beside Fixed Length Account Codes field, click Save. •	A warning message will display indicating the Account Code Setting has been updated. Click OK.
3. In the column header and in the first column, click Add button. 5. If you are creating ‘Fixed Length Account Codes’, enter the account dode, ensuring the number of digits matches the specified Fixed Length Account Codes length. 6. If you are creating ‘Unrestricted Account Codes’, you can enter an Account Code without any restrictions on the number of digits. 7. In the Description field, enter a brief description for the ‘Account’. 8. In the Owner field, select the Account Owner from the drop down. 9. Check the Restrict checkbox if you want to apply the account code restrictions. 10. In the Min and Max fields, enter the minimum and maximum length of phone number respectively. To restrict calls starting with digits that match a list of specified prefixes, you can specify multiple prefixes separated by commas (,). The account code restrictions will apply if you check the ‘Restrict’ checkbox for the account. 11. In the Prefix field, enter the prefix code for the phone number (if desired). If the phone number dialed is less than the minimum or more than the maximum number of permitted digits, the account code restrictions will block the call. 12. Check the Active checkbox to activate the Account. 1. Click Delete button beside the Account Code record that you want to delete. An alert message will display. 2. Click OK. The Account Code will be deleted. To ensure historical information is displayed correctly on reports, we STRONGLY discourage the deleted of account codes that have been used in the past. Rather than delete the account code, it is recommended that you uncheck the Active check box. 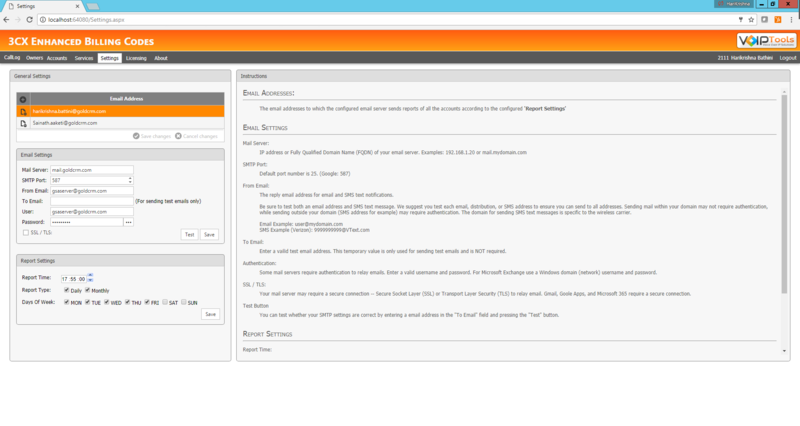 The Services tab enables you to ‘Stop’, ‘Start’ or ‘Refresh’ a service. •	To start or stop a service, click Start/ Stop button. •	Click Refresh link to update the status if changes to the service status were made directly in the windows Service Snap-in. If the service status is “Unknown”, this is typically caused by the 3CX Enhanced Billing Codes IIS Application Pool user having insufficient rights. To view changes to the service state made in the Windows services applet, press the refresh button. The Settings tab enables you to set Global email addresses, Email settings and Report Settings. IP Address or Fully Qualified Domain Name (FQDN) of your email server. Default port number is 25. (Google: 587). This is the email address from which the emails and SMS text notifications will be sent. Be sure to test both the email address and SMS text message. We suggest you to test each email, distribution, or SMS address to ensure you can send to all addresses. Sending mail within your domain may not require authentication, while sending outside your domain (SMS address for example) may require authentication. The domain for sending SMS text messages is specific to the wireless carrier. Enter a valid test email address. This temporary value is only used for sending test emails and is NOT required. Enter login credentials of the email account from which you want to send the reports (if required by your mail server). Your mail server may require a secure connection – Secure Socket Layer (SSL) or Transport Layer Security (TLS) to relay email. Gmail, Google Apps and Microsoft 365 require a secure connection. You can test whether your SMTP settings are correct by entering an email address in the ‘To Email’ field, then click the ‘Test’ button. You schedule when automatic reports are sent by entering the desired time in the ‘Report Time’ field. Owners will receive automated reports that include data for their assigned account codes, while Global email addresses will receive emails containing date for all accounts. 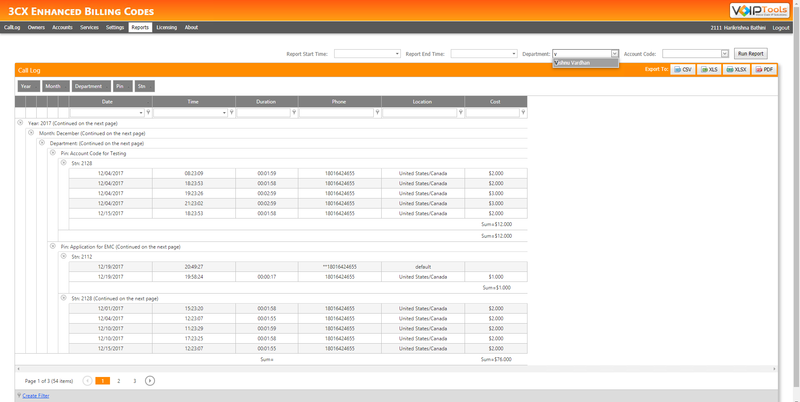 You can generate automated reports on a daily, weekly, and/ or Monthly basis. Select the day(s) of the week so that the report will be emailed on all the selected days of the week. 1. To define who should receive automated reports containing all accounts, on the left of the Email Address column header, click Add button and add email addresses. The grid supports batch edit which enables you can add or delete or edit multiple addresses before you save update the list. 2. In the Email Address field, enter the email address that will receive automated reports containing all accounts. 3. Click Save changes to save the email addresses. 1. In the Email Address grid, locate the email addresses to be deleted. 2. Beside the desired email address, click Delete button. 3. Click Save changes to save the changes to the grid. 1. In the Email Address grid, look for the email addresses that you want to delete. 1. On the Settings menu, in the Email Settings section, in the Mail Server text field, enter the IP Address or Fully Qualified Domain Name (FQDN) of your email server. 2. In the Port field, enter the port number of the mail server. 3. In the Reply Address field, enter the email address from which the reports will be sent. 4. In the User and Password fields, enter the login credentials of the email account from which you want to send the reports (if required by your mail server). If you want to reveal the password, click More More button; and to conceal it, click the same button once again. 5. Check SSL/ TLS check box if your mail server requires a secure connection. 6. To test if SMTP settings are properly configured, enter a valid email address in the To Email field and click Test. 7. Click Save to save the Email Settings. 1. In the Report Time field, select the desired time to send automated reports. a. Daily – if you want to send the reports regularly for the selected day(s) of week. b. Monthly – if you want to send the reports on a monthly basis. If you select ‘Report Type’ as ‘Monthly’ then, the report will be emailed on the last day of every month at 11:59:59 PM. 3. Select the desired Day(s) of Week to send automated reports. ‘Days of Week’ is multi-selective. 4. Click Save to save the Report Settings. To filter records based on a range of dates, enter the call starting time in the Start time field. To filter records based on a range of dates, enter the call starting time in the End time field. 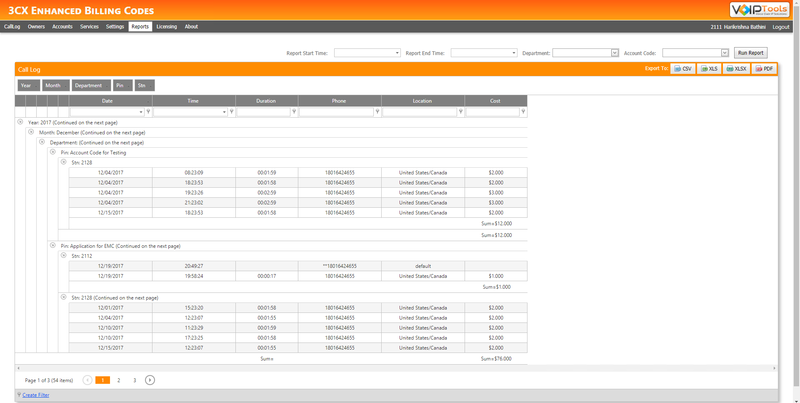 Displays the list of owners which when selected, the resulting report will display reports that belong to the owner. You can sort required data through the adhoc row. Displays the list of Account Codes which when selected, the resulting report will display reports that belong to the code. Click the button to view the report for the selected report time range (Report Start Time and Report End Time). The year in which the call log was generated. The month in which the call log was generated. The extension number from which the owner initiates the call. The start time of the call. The end time of the call. The telephone number to which the owner initiates the call. The location of the telephone number to which the owner initiated the call. The cost for the call made by the owner that initiated the call. The checkbox will be checked if the call is answered or unchecked if the call is not answered. When a user runs a report based on Time Range only, the system retrieves the reports of all the users that fall within the selected Report Time Range. 1. From the Report Start Time date box, select the start time for the time range within which you want to run the report. 2. From the Report End Time date box, select the end time for the time range within which you want to run the report. 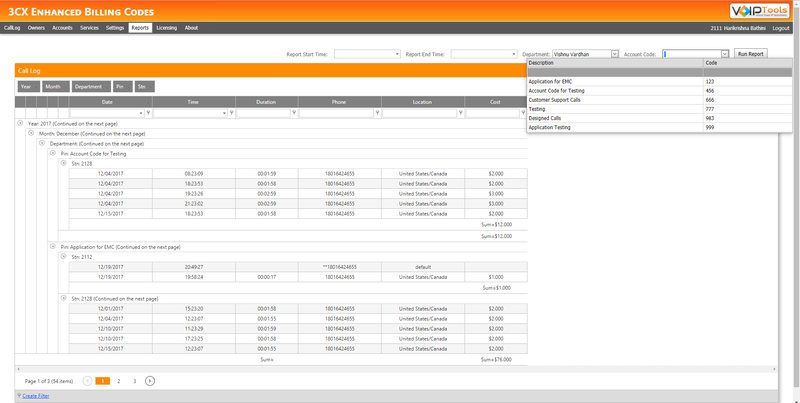 When a user runs a report based on Time Range and Department value, the system retrieves the reports of the selected owner that fall within the selected Report Time Range. 3. From the Department drop down list, select the owner for whom you want to retrieve the report data within the selected ‘Report Time Range’. 1. While running a report, ‘Report Start Time’ and ‘Report End Time’ cannot be blank. 2. A single owner can contain multiple accounts. Hence, while retrieving the data of an owner that has more than one account, the system retrieves call log reports for all the accounts of the owner that fall within the selected Report Time Range. When a user runs a report based on Time Range and Account Code value, the system retrieves the reports of the selected Account Code that fall within the selected Report Time Range. 3. From the Account Code drop down list, select the Account Code for which you want to retrieve the report data within the selected ‘Report Time Range’. When a user runs a report based on Time Range, Department value and Account Code value, the system retrieves the reports of the selected owner’s specified Account Code that fall within the selected Report Time Range. 4. From the Account Code drop down list, select the Account Code of the selected owner for which you want to retrieve the report data within the selected ‘Report Time Range’. You can export the retrieved report data to various formats like CSV, XLSX or PDF. 2. If you want to retrieve report data for a specific owner, select the owner from the Department drop down. 3. 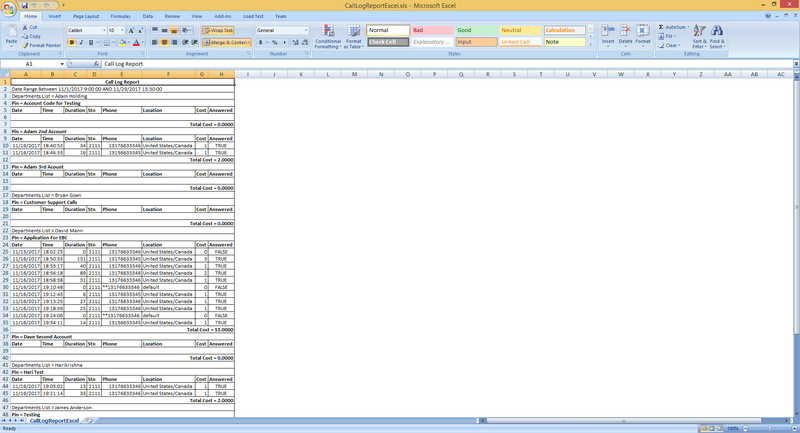 Click Run Report to run and display the report for the selected filter values. 4. On the Call Log header, beside Export To, click appropriate export button to export the report in your desired format. The 3CX Call Flow Design is a voice application program that interacts with the user via the phone and then performs certain logic. For instance, a voice application program can be designed to ask a caller to input a customer number, which is then verified against a database. Based on this number, the call will then be routed to the required queue. 3CX Enhanced Billing Codes enforces the use of billing codes for configured outbound call types. The short-cut option eliminates the prompts for faster dialing. Dial ‘9’ and wait for the “beep” then dial your account code and phone number using the syntax **# For example: 12345**8016424655#.